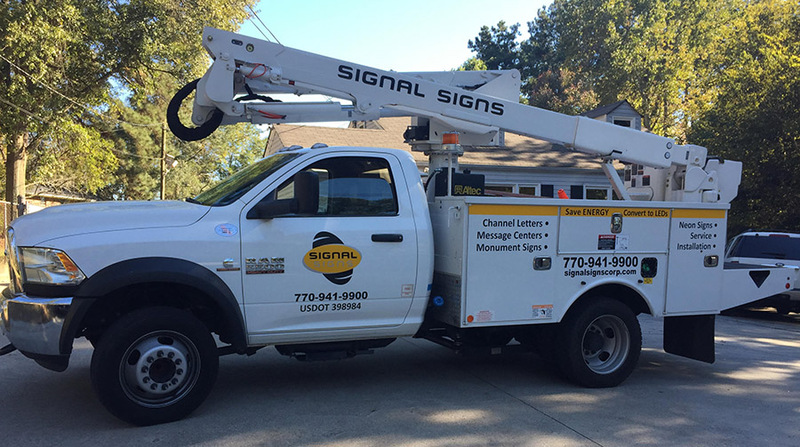 With over 30 years of experience in the sign business, Signal Signs is a leader in the sign industry. Our clients, from small businesses to national franchises, can expect professionalism and excellence from concept to completion. Our state of the art manufacturing equipment and highly experienced staff insure a high quality product every time. Our staff is fully equipped to handle every step of the process from design to installation. Our sales team assists with site surveys and securing signage permits, as well as coordinates with contractors and job superintendents to ensure your job is completed in a timely manner. Our innovative graphic designers work closely with you to incorporate your current company logo or create a new customizable image. Project managers focus on ensuring your specifications and product quality requirements are met during the manufacturing and installation processes. Additionally our professional installers will deliver and install your sign on time and in full compliance with local codes. With our experienced staff, we can turn your idea into an impressive reality. At Signal Signs we understand that a sign is advertising that embodies the unique character of your business. We ensure that your signage will not only tell your story in a glance but also go beyond all of your expectations.